I do a quite a lot of work in the Digital Audio field. I was talking to some of my friends about the potential merits of a 96 Khz sample rate instead of 48 Khz or 44.1 Khz sample rates. I wrote this program to demonstrate the limitations of a perfect A/D and D/A at a specific bit resolution and sample rate. The program will show you how a specific audio signal would be rendered digitally given an A/D converter with specific characteristics. Then the program will show you how the audio signal will look like on the output of a D/A converter with a specific type of output filter. The results can be surprising. This current version does not take into account the various output filters that are in use, however. 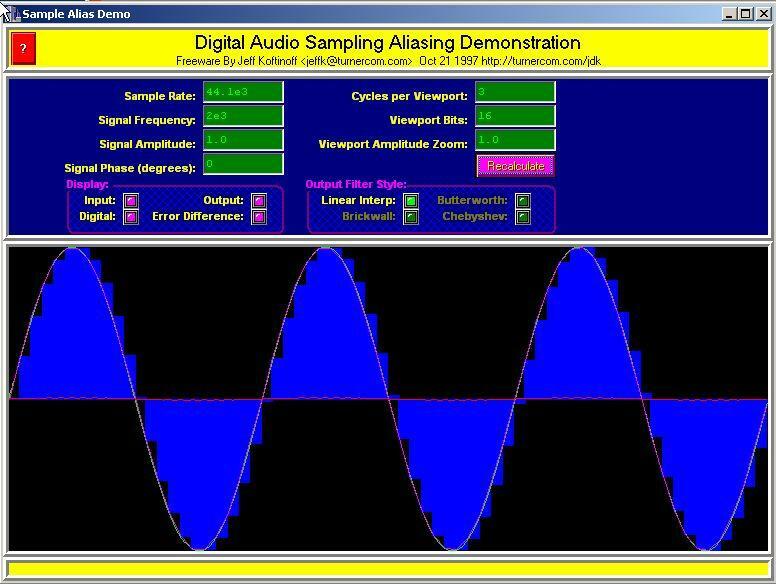 Unfortunately with this program you can not simulate a signal fading up and down in amplitude. Read all about what happens and why dithering is good at Frank Klemm's Dither and Noise Shaping website.